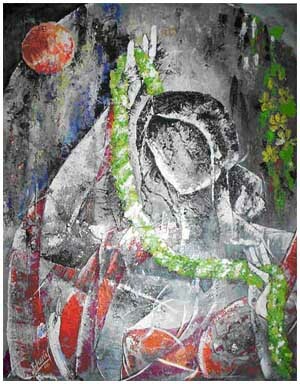 1991 Graduated in Art-DRAWING/PAINTING from Agra University. 2006 Shanta Art Gallery, Jungpura, New Delhi. 2006 Creativegarh Gallery, New Delhi. 2005 Lalit Kala Academy, New Delhi. 2004 India Habitat Centre, New Delhi. 2006 Collectors Shop Art Gallery, New Delhi. 2006 Triveni Kala Sangam, New Delhi. 2005 India Habitat Centre’s ‘Habi Art Gallery’, New Delhi. Mrs. Sheila Dixit (C.M. of New Delhi), VIP’s and dignitaries, Mr. Sood, General Motors, (Van Dyke Ave, warren, MI), Clewate house, different personal collectors.NGOs,and interior decorators, worldwide..
Shilp Gram, Agra, CGO, Directorate, New Delhi, Group Centre’s and many officers messes of Hyderabad, Bangalore, Bawana, New Delhi, etc. When mind floates on the wings of thoughs, wants to innovate untouched, unthought, unimagined, unanswered, than unmistakably shapes take place, on the canvas, it is my world of imagery, where untouched reality affects mind, body, heart and soul. Do you want to see how god comes on earth, how humane can behold mystic-heavenly beauty, how man can be transformed saint,how mind soars high on the wings of imagination. 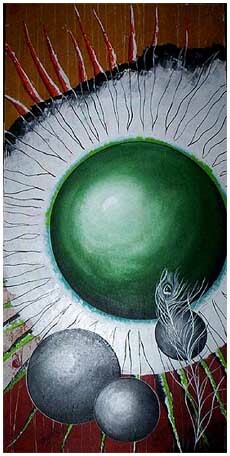 All cannot be answered if you do not touch the mystic interpretation on my canvas, where,d epression cannot keep its way and light, beauty, inspiration, energy and new heights of imagination take place. I‘m not escapist who wants go be far from tha harsh realities of world, but confirmist who sees this world, full of beauty, energy and peace and solitude, and where these are not, we need to bring them there. We are responsible to make world ugly or beautiful, than why not beautiful at all!